Designed for use in by students aged 14 to 18. This small book, authoritative and passionate, is part of the Groundwork Guides series. It discusses numbers, causes (including war, corruption, and poverty), and conditions (today, slaves are cheap and that makes them disposable, thrown out when weak or sick), all within an overview that shows that human trafficking now is often in children, whether as soldiers, prostitutes, or forced labor. "As a high school World Cultures teacher, who for many years, has taught my students about modern slavery, I am constantly looking for the best resources to excite my students into action. I have read all of Kevin Bales' books including the modern slavery "bible," Disposable People, but I find them too lengthy to bring into a semester course. 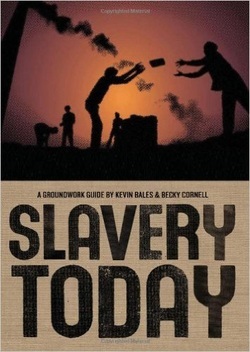 This new book, also written by the modern slavery authority Kevin Bales, combines all of the successful elements of his other books: anecdotal evidence, statistics, personal stories, world government reactions and ways to help but does it in an accessible format that lends itself to time limitations. After reading this new book, I gave it to a few of my students to get their reactions. They said what a fast read it was and how they were compelled to finish. Also exciting was that they said they then registered on the freetheslaves website and were now called to do more than just know about the problem. I have on my teaching budget a classroom set of these books and hope to find the money to buy one for each student. The hope is they take the book home and share with their parents, friends and neighbors. The realities of modern slavery need to be exposed and this little 141 page book may just be the device necessary to carrying out this necessary project. My suggestion is any social studies teacher, specifically economics teachers, should be using this book to teach the basics of global economies, supply and demand, fair trade vs. free trade, and other economic basics that are often cold and not interesting to students. Put a face and a story behind the concepts and not only do you teach the definitions, you awaken the world to the continued injustices happening each and every day; and most importantly,you empower your students. Teaching students to make subtle but important choices through their purchases teaches responsibility and respect for humanity and the power of their economic buying power." Royalties from this book support anti-slavery projects.